The Algarve in Portugal is one of the hottest tourist destinations in the world. It’s a beautiful area that has lots to offer such as beautiful beaches, historic sites, and even wineries. When you visit the Algarve you want to find a place to stay that is in a good location and has a lot to offer. The Holiday Inn Algarve may suit your needs. 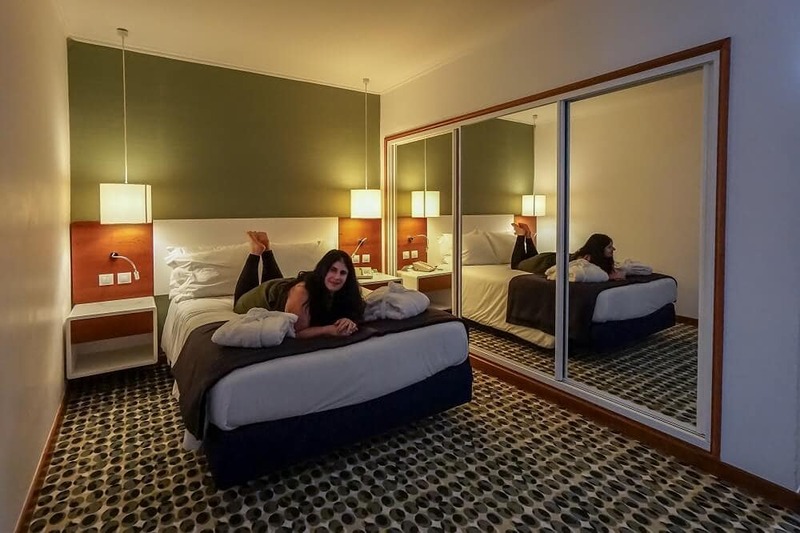 It’s been rated as the best value hotel in Armação de Pêra by Tripadvisor. Keep reading for my detailed review to understand why we think it’s one of the best places to stay in the Algarve. The Holiday Inn Algarve opened in 1962 and was one of the first hotels in the area. It was called the Garbe Hotel and owned by a local family. In the 80s, they sold the hotel to the Crimson Hotel Group. In 2010, the hotel joined the Holiday Inn brand. While the hotel follows Holiday Inn standards, it is still independently operated. 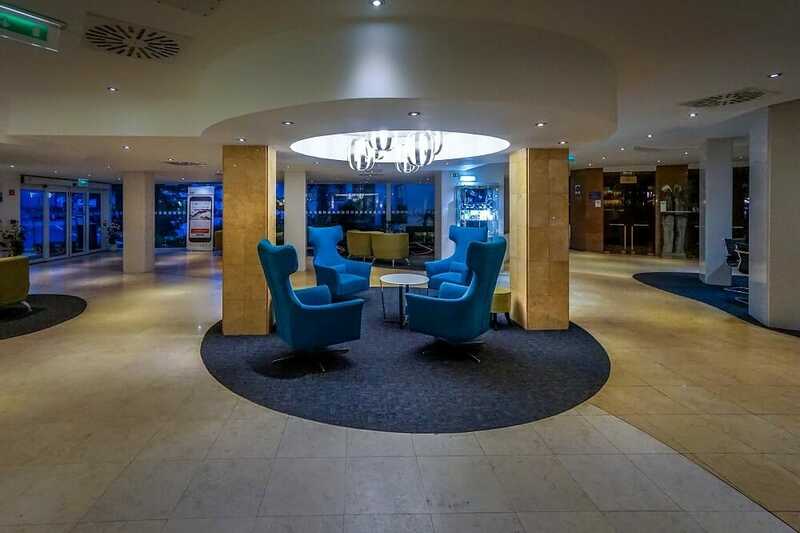 The Holiday Inn Algarve has been renovated several times over the years most recently in 2015. You would never know the hotel is almost 60 years old! 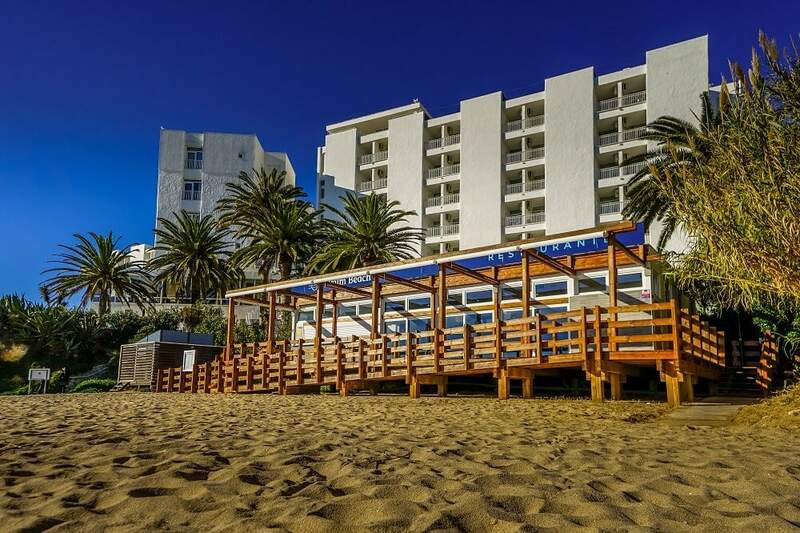 The Holiday Inn Algarve is located in the town of Armação de Pêra, which is on the coast between Albufeira and Portimao. I think this is the best area to stay in the Algarve because it is centrally located. 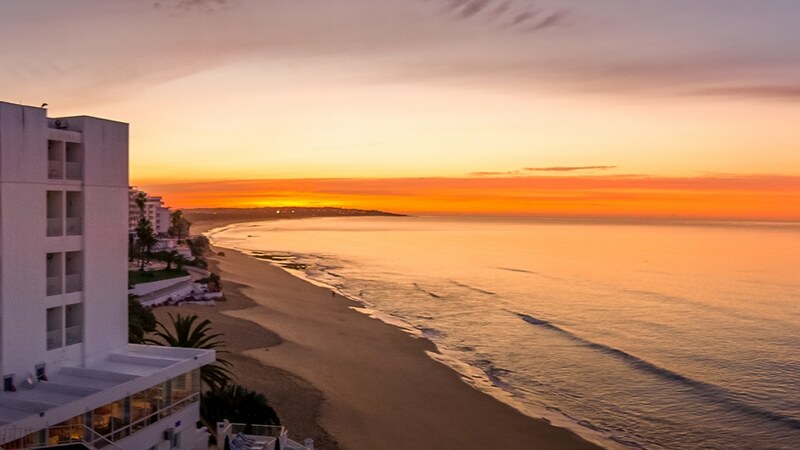 Albufeira is one of the most popular towns in the Algarve and you can easily drive to the western or eastern edges of the region. The hotel itself is located on the promenade and the beach. 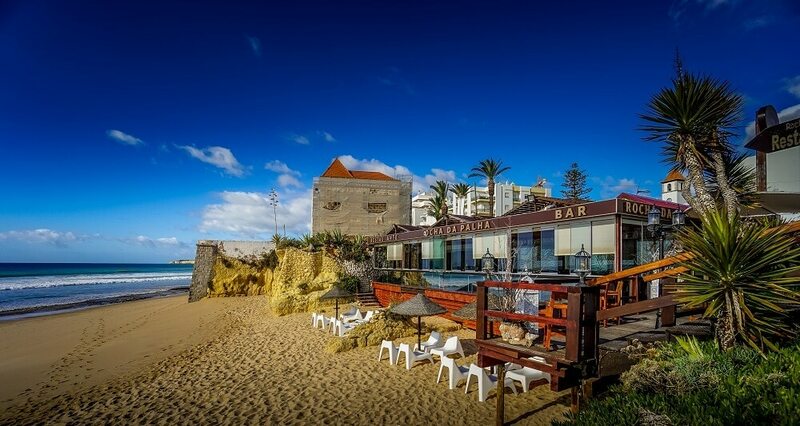 You have stunning beaches on one side of the hotel and the lovely town of Armação de Pêra on the other. It’s a beautiful area to walk around and explore. The beach extends the length of the town. You will find plenty of restaurants, a local market, and a 17th-century fort within walking distance. The church in Armacao de Pera. Given the perfect location, you do not need a rental car during your visit if you stay at the Holiday Inn since there is plenty within walking distance. Keep in mind that it is a 40-minute drive from the Faro airport and there are other places in the Algarve you might want to visit (i.e. 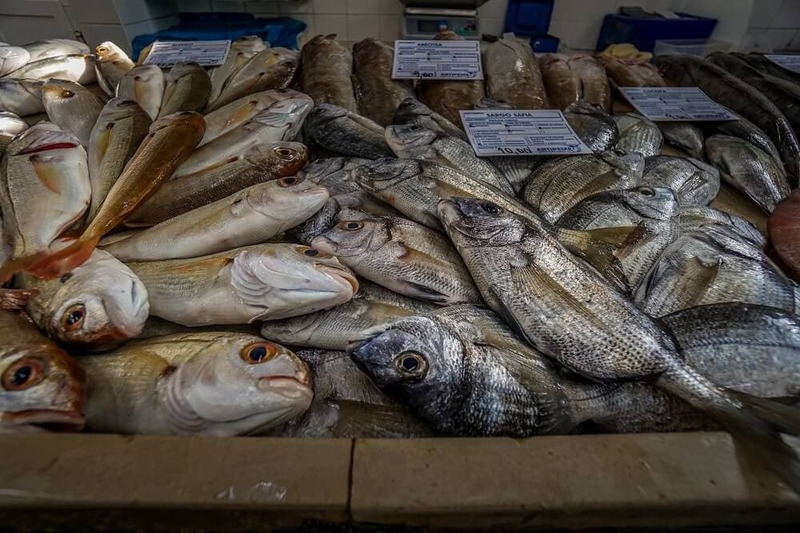 Tavira, Lagos, Sagres, etc). 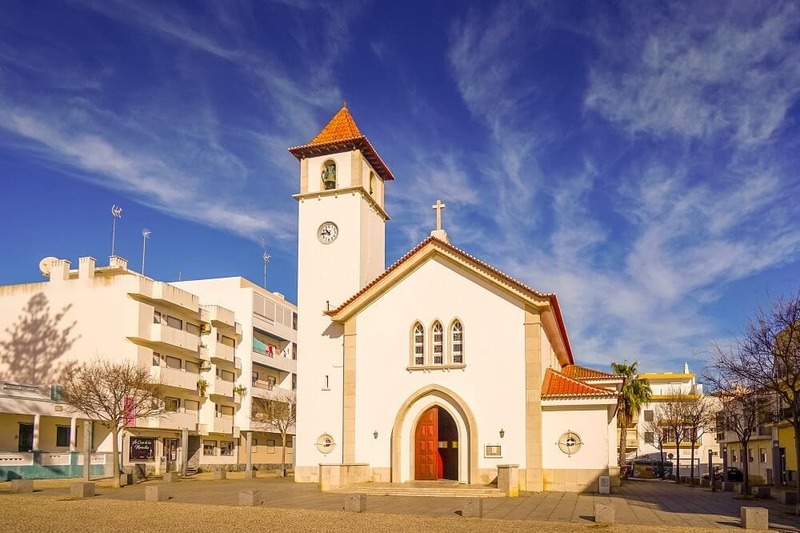 You can get a taxi from the Faro airport and then relax in the Armacao de Pera area or rent a car and have the flexibility to see more of the Algarve. When we arrived, Hasan was there to check us in. He told us that we had been upgraded to a suite, which was a pleasant surprise. We completed the paperwork and got our keys. 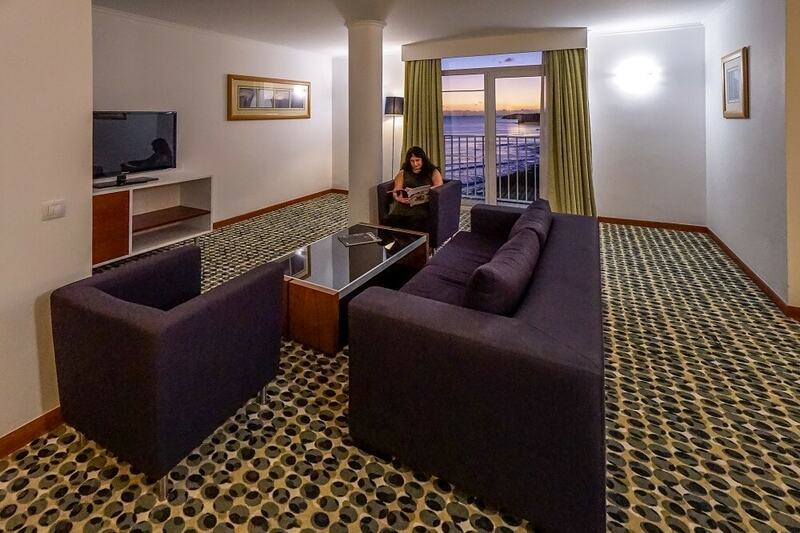 We were impressed with our executive suite at the Holiday Inn Algarve. It featured a large lounge area and balcony. In the lounge area, there was a sofa that can pull out into a bed plus two chairs. It also had a tv. Our balcony with a view of the beach and the Mediterranean Sea. 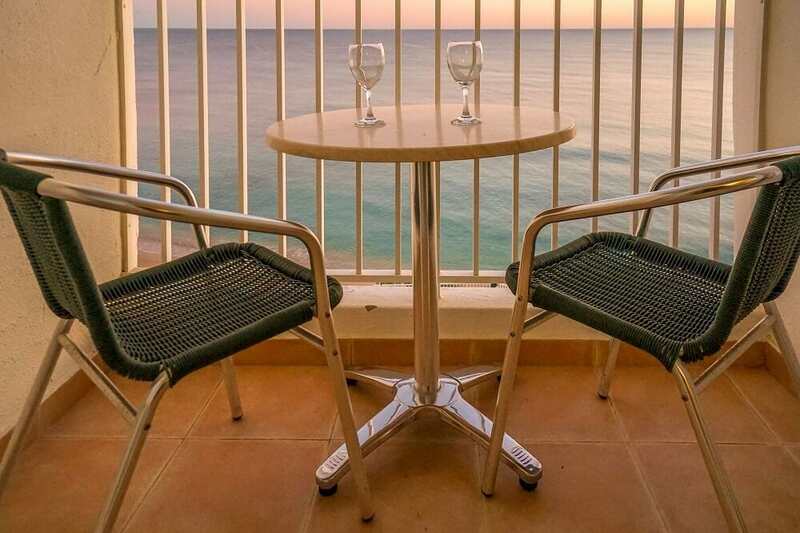 The balcony had a table and two chairs so perfect to enjoy a glass of wine or even a meal from the room service menu. From our balcony, we had a clear view of the beach. I even took my computer out on the balcony to do a little work. On the other side of the lounge area, there is a Juliet balcony. In our room, this faced west so was ideal for catching the sunset. 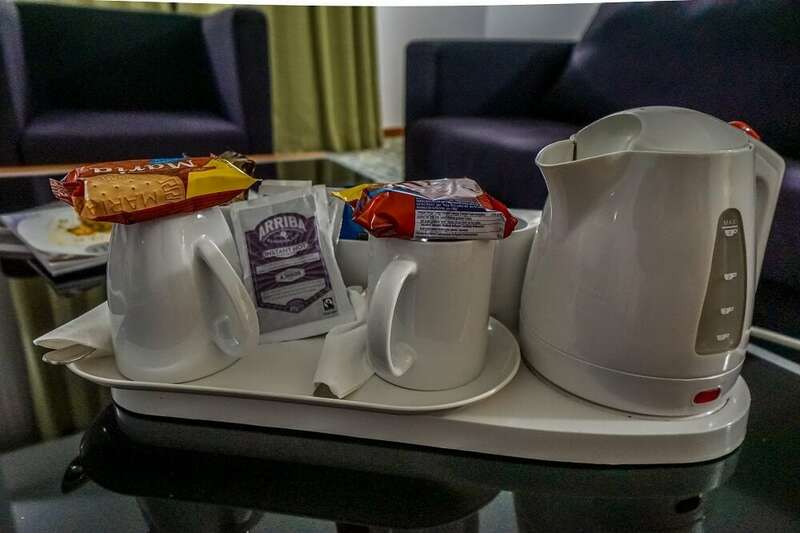 They also had a large desk in the room, that also had a mini-bar, kettle, and generous tea and coffee selection. Although you can drink the water without any worries, the hotel does also provide complimentary bottled water (both still and sparkling) in the suites. Wifi throughout the hotel is free, you don’t even need a password. You can make tea, coffee, or hot chocolate in your room. In the bedroom area, we had a double bed and two nightstands. Unlike many other hotels we have stayed in on the European continent that have two twin beds pushed together, we had a real double bed. The closet was one of the biggest I have ever seen in a hotel room. There was an iron and ironing board there too. The safe was a generous size and easy to use. We kept our passports and computers inside. The Armação de Pêra hotel also has beach and city (land) view standard rooms. All the beach view rooms have balconies. The entire hotel is non-smoking. The bathroom was spacious! It had a bathtub with a shower with good water pressure. In addition to the Dove and Lux brand soap and shower gel dispensers, they also provided travel-size Design Amenities toiletries and a vanity kit that included a sewing kit, shower cap, and q-tips (cotton buds in the UK). The towels were huge and we also had comfy white bathrobes to wear. There was a hairdryer too. Next, to the toilet, there was a bidet. Note: The hotel does have a few accessible rooms with only showers. A standard room at the Holiday Inn Algarve. Breakfast was included in our stay. I am a big believer it is the most important meal of the day, especially when you are going to be doing a wine tasting tour or a long hike! I was impressed with the breakfast buffet at the Holiday Inn. Not only did it have a wide selection (eggs, sausage, mushrooms, hash browns, meats, cheeses, pastries, cereal, etc) but everything I tasted was delicious. 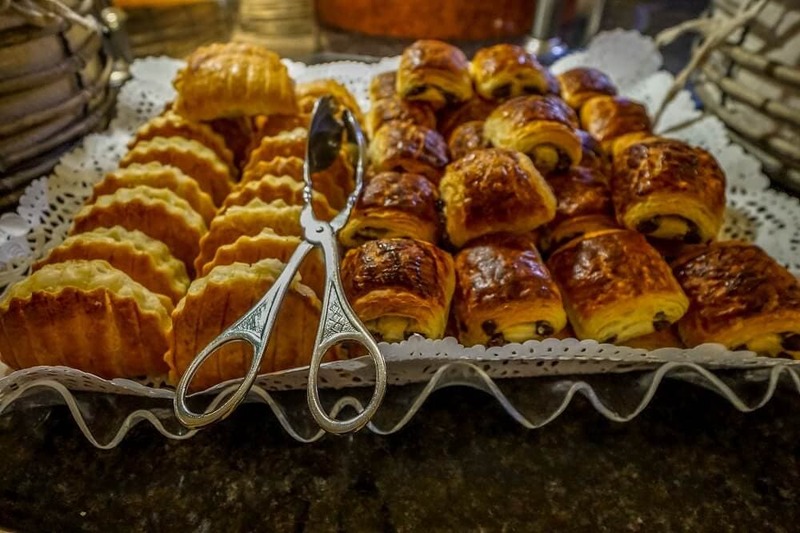 The restaurant that serves a buffet for breakfast, lunch, and dinner. 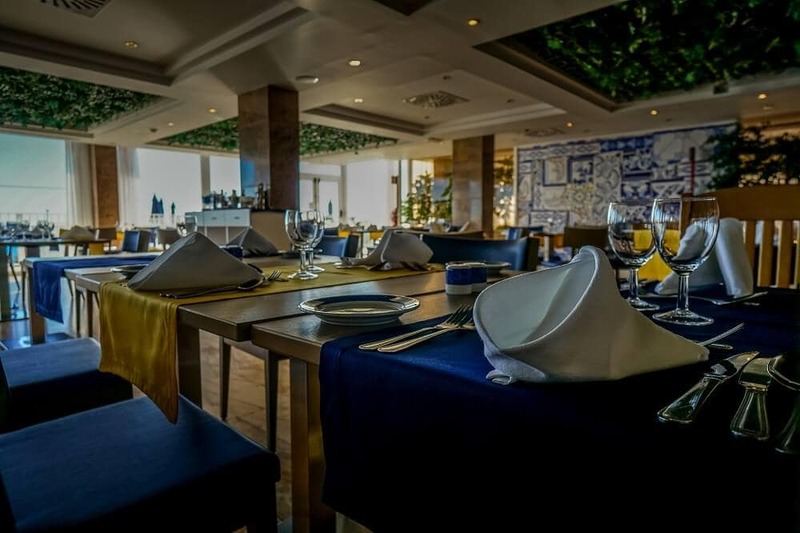 The buffet restaurant, Pôr do Sol, has an amazing view of the sea and is also open for lunch and dinner. You can even sit outside on the balcony if you like. In addition to the buffet restaurant, the hotel also has an Indian restaurant, Raj, and a seafood restaurant on the beach, Palm Beach. Unfortunately, we couldn’t try either Raj or Pal Beach as both restaurants were closed at the time of our visit in January since it is low season. At the bar in the hotel, they have live music twice a week at 9 pm, even in the off-season. During the winter, you can get free tea and coffee. 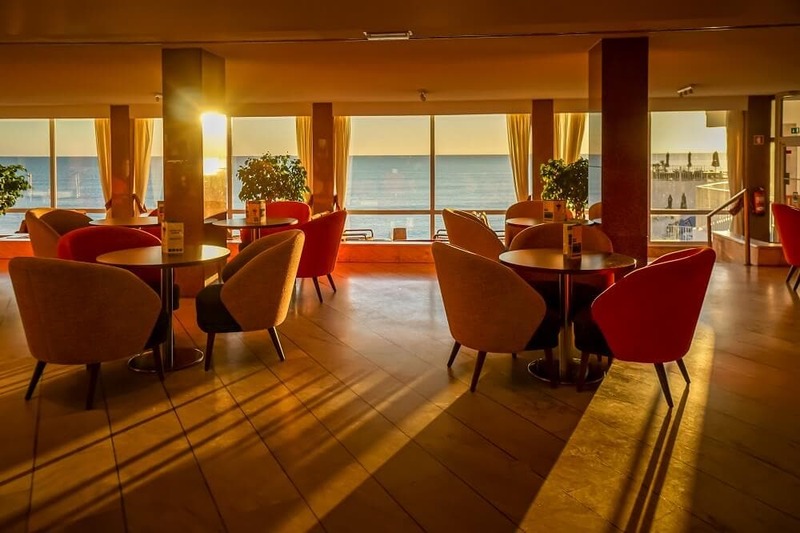 The bar has huge windows with gorgeous views of the Mediterranean Sea. The hotel bar where they have live music twice a week. The pool at the Holiday Inn overlooks the beach. 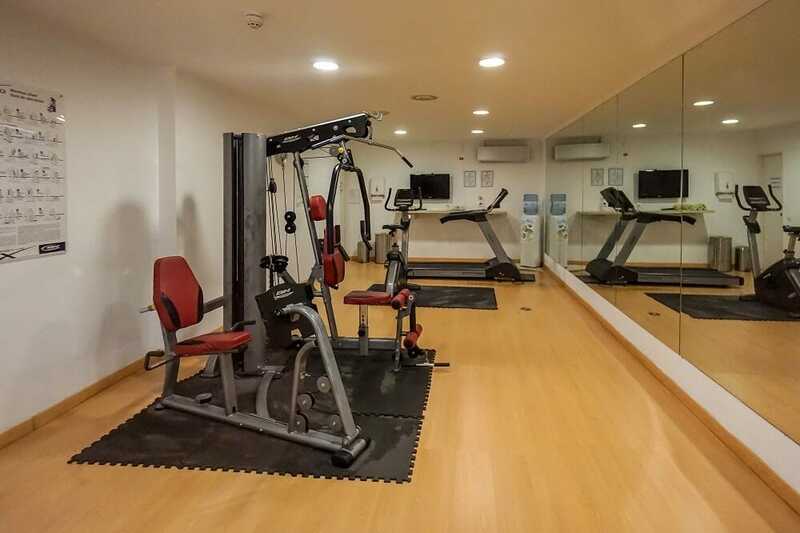 The Holiday Inn Algarve has a few other amenities worth mentioning. First, they do have a small gym. With the nice weather year around, I think most guests will opt to take their workouts outdoors (we chose to do a hike), but it is nice to know you have a treadmill, stationary bike, and some weight equipment as an option. If you want to pamper yourself, the hotel does have a hairdresser and spa. Both operate by appointment and speak English. With the nice weather in the area, the gym at the Holiday Inn doesn’t get much use! 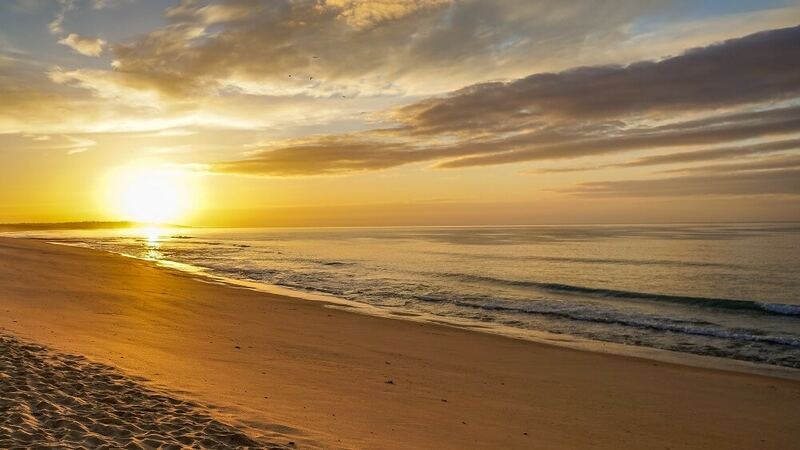 Sunrise on the beach in front of the Holiday Inn Algarve. 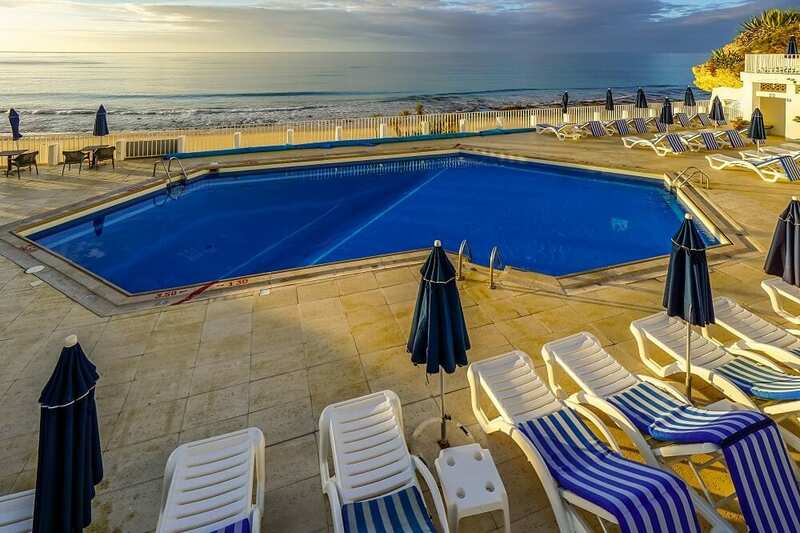 The hotel is located on the Armação de Pêra beach, so you must visit it during your stay. When we visited in January, it was so peaceful and perfect for a morning walk. There are a few different staircases that will take you down to the beach and there is even one ramp that is wheelchair accessible. The number of visitors in the Algarve varies dramatically between the high season (July – August) and the less busy times. The time we visited in January was very quiet. We loved having places to ourselves – especially beaches and restaurants. On the other hand, some restaurants we would have liked to try were closed. The weather may have been too chilly to swim in the sea, but we would return to the Algarve in the low season. One other benefit in the offseason is the lower price for hotels. During the winter, you can get rooms at the Holiday Inn Algarve for about a quarter of the price it would be during the peak times. You know a hotel provides good service when they have guests that keep coming back year after year. At the Holiday Inn Algarve, not only do they have guests that have been returning for years, but they have a guest that wanted to memorialize her husband at the hotel and bought a plaque for one of the benches. I can see why people keep returning, we loved our room and the location. The service we got at the hotel was excellent too. Our room was cleaned daily while we were away and I thought the staff did a great job working around our stuff. Also, we only brought one adapter, and with all the tech equipment we need to charge that doesn’t cut it. The front desk was happy to provide us with one for use during our stay. We also forgot our sunglasses and the hotel had some fun green ones for us. Note: In 2017, the hotel won the Tripadvisor Award of Excellence for consistently getting outstanding traveler reviews on TripAdvisor. The Holiday Inn Algarve is part of the IHG Rewards program so you can earn or redeem points for your stay. Other brands that are part of IHG include Intercontinental, Kimpton Hotels, Hualuxe Hotels, Crown Plaza, Voco, Hotel Indigo, Even Hotels, Avid Hotels, Staybridge Suites, and Candlewood Suites. We loved our stay at the Holiday Inn Algarve. Our executive suite had everything we could ask for. I felt like we were staying at a boutique hotel rather than a Holiday Inn. The staff was friendly and accommodating. Even in the off-season, there was plenty to do. It would have been nice to try more of the restaurants, but that’s just one of the reasons we plan on coming back. Check out our video to see more. 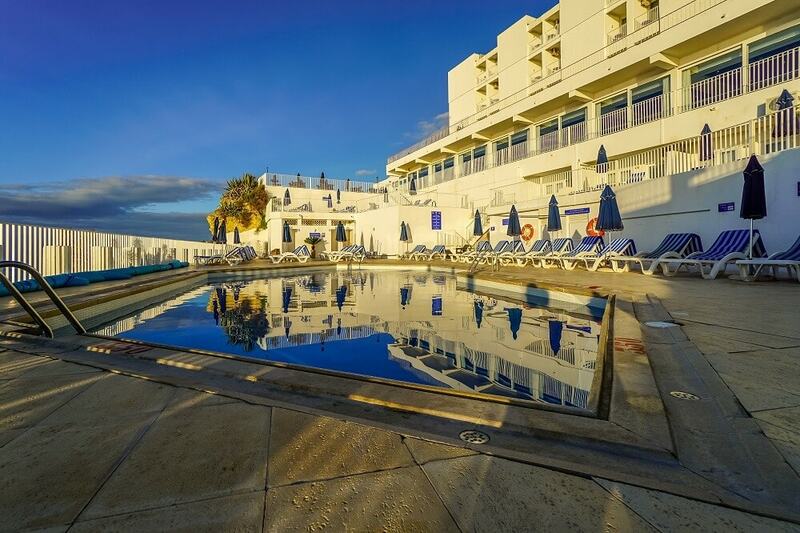 Click here to check pricing and availability at the Holiday Inn Algarve. Don’t forget your bathing suit, the pool is heated in the winter. Check out the restaurants, local market, and historical fort within walking distance. Visit in the winter for a quieter holiday, the summer is the peak season. Disclosure: We were guests of the Holiday Inn Algarve. All opinions are our own. Want More Travel Inspiration and Tips? Enter your email to join the Two Traveling Texans email community. We send out emails with travel tips and inspiration about once a week. As a bonus, we will send you our FREE Printable Travel Planner. Just enter your information below, you can unsubscribe at any time. Anisa is an experienced international traveler with extra pages in her passport and stamps from 41 different countries across 5 continents (and counting). She was born and raised in Texas. After a 13 year stint in NYC, she moved to England to live with her husband. This looks like a lovely place to stay. I admit, I would park myself on that beach and never leave. Olivia – We didn’t want to leave! Even though the water at the beach was a bit cold for me, we loved walking in the sand. Wow! This looks like such a beautiful hotel. I am like you, love visiting destinations like this In the off season when it’s quiet. And I love when old/historical places get rebranded! Yes we actually haven’t done that much offseason travel. We definitely want to do more. Glad you liked the hotel. The hotel looks amazing. When I went there I overlooked this place because I was spending time with friends that wanted something cheaper but this is great for when I go back. Sujenne – Nice to hear you liked the area. The Holiday Inn is very affordable during the offseason. I hope you get the chance to stay there when you go back. Holiday INN is always nice as it keeps the standard without giving us surprise. It is unusual that this one is next to the beach, while usually it is located to some business districts. Glad to hear you have had good experiences with Holiday Inn! Wow what a gorgeous location! It’s so nice that there are rooms here with views of the ocean. I love traveling in the off season to places and it looks like this would still be a great place to visit, even if the ocean is too chilly to swim in. Brianna – Yes the location was perfect because it was right on the beach and the town was right there too. It was a great place to relax during the winter. Portugal is on my bucket list, I’m hoping to visit this year. This place looks super nice and comfortable, I’ll definitely keep it in mind for my travels. Nerissa – I hope you get to visit Portugal. This hotel is the perfect base for exploring the Algarve region. We have been wanting to visit Portugal. One of the hardest decisions is always where to stay. The hotel looks beautiful and the views…Stunning!! I’ll have to keep this hotel in mind when we finally get a chance to make it over there. Amy – Portugal is amazing and you will not be disappointed with this hotel. We loved our stay. Even if this was a run down 2-star hotel, I’d stay here just for the location alone! 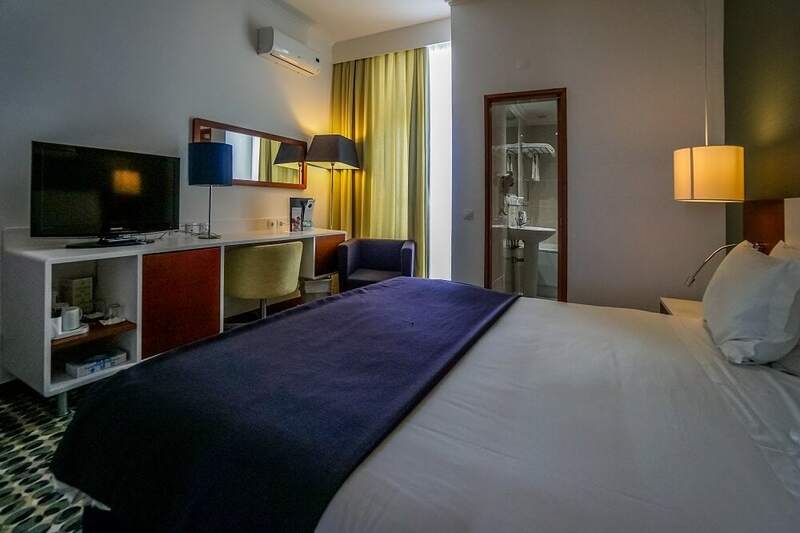 The fact that the rooms are spacious and comfortable, and all the amenities you could possibly need are on site, make it a no-brainer for me to stay here. I’m a big breakfast gal too and love when hotels offer hot breakfast options like eggs and sausage. Great find! Diana – You would love this hotel. It is perfectly located and so well equipped. I loved the breakfasts too. First of all I love beach towns and this hotel right on the beach looks amazing! Those views especially at sunset are incredible. Happy to see that you really enjoyed yourself and that service was good. Johanna – You would love the Algarve and this hotel! We’ve stayed here three times and love it. The only thing I don’t like is having to pay per person for a sea view as a pose to per room. But it is a lovely hotel in a fabulous location. I was once in Armação de Pêra. I had the most delicious Arroz de Marisco on the beach – waited 1 hour for it to be prepared, but it was totally worth it. Would love to return and actually stay in the village next time! Sabrina – I loved the area too. The seafood we had there was amazing too. This hotel is on point, guys! I love that it offers the heated pool in the winter months so that you can still enjoy a little bit of water while in the Algarve. Your suite looked so roomy and spacious, I felt like I could move in and just live there! Thanks for a great review! Michelle – Thank you! Yes, we didn’t want to leave! What a great hotel. I have stayed at a few wonderful holiday inns and need to add this to my list. Would love to explore the Algarve. Thanks Kelly! You would love the Algarve. Best part is the location, but it looks like a great place to stay. Emese – We just loved the area! Want a printable 1-page Portugal Itinerary for your trip? Claim your FREE Printable Portugal Itinerary and join the Two Traveling Texans email community. We send out emails with travel tips and inspiration about once a week. Please check your email to confirm your subscription and get your itinerary.